1. Haviva Reik was born in June 1914 in the Slovakian village of Nadabula. One of seven children, she grew up in the Carpathian Mountains. 2. As a young woman, she joined the Zionist Socialist youth movement Hashomer Hatzair and in 1939 made aliyah. She joined Kibbutz Ma’anit, where she coordinated the citrus harvest. Before long, she enlisted in the Palmach. 3. In 1942, the Jewish Agency Defense Department, working in coordination with the British Special Operations Executive (SOE), asked the Palmach for volunteers to go behind enemy lines. They needed people who spoke the languages and knew the lands and cultures of Central Europe. Reik signed up. She joined the WAAF and received specialized training from the SOE. 4. She was with a group to be parachuted into Nazi-controlled Slovakia, but the British balked, refusing to send a woman on a “blind drop.” Determined not to be left behind, she hitched a ride with an American military transport and made her way to the rendezvous. The group set up their operations in Banska Bystrica. 5. An uprising had been planned there against the Nazi-controlled puppet government. Her group helped organize Jewish groups in the resistance. Reik was in charge of a public kitchen that served thousands of refugees; she facilitated the escape of Jewish children to Hungary and thence to Palestine; and she helped rescue Allied pilots who had been shot down. For six weeks, she carried out this double function, organizing Slovakian Jews and aiding Allied airmen. 6. The uprising was delayed, and the Germans advanced on their location in October of 1944. When her group prepared to escape to the mountains, she advocated for taking all the Jews who wanted to go, not just the young and healthy. Along with about forty Slovakian Jews, they set up camp in the forest. 7. The camp was overrun by Ukrainian pro-Nazi collaborators in November 1944. She was captured, executed and buried in a mass grave. 8. After the war, her body was exhumed and buried in a military cemetery in Prague. In September 1952, her remains were brought home and reburied in the Mount Herzl Cemetery in Jerusalem. 9. She wrote, “Every day we are alive is a gift from the heavens.” An excrutiating truth in her case, and not a bad existential stance for the rest of us. 10. Kibbutz Lahavot Haviva, Givat Haviva Institute, a river, a gerbera flower, a water resevoir, a ship used for (illegal) immigration to Palestine, and numerous streets in Israel are named in her memory. In southeast Tel Aviv, Haviva Reik Street is located east of the Ayalon River and south of LaGuardia Street. 1. Little is known about the early life of Judah ben Solomon AlHarizi. He was born about 1165 in Spain to a family that boasted at least one scholar and one poet of note. He became one of the last great personalities of the Golden Age of Jewish culture in Spain. 2. The first 25 years of his life were spent in study. He was fluent in Arabic, Aramaic, French, Latin and Greek, in addition to Hebrew. 3. At about the age of 25, he began to travel: to France, Italy, Greece, Syria, Palestine, Persia and Egypt. And he began to write poetry; his works are suffused with impressions from his journeys. For the rest of his life, he traveled, rarely spending a long time in any one place. After some lean years, he was comfortably supported by patrons. 5. A thorough rationalist, he also translated Artistotle’s “Ethics” and “Politics.” He translated several Greek and medical treatises and wrote a treatise of his own in Hebrew – leading scholars to propose that he may have been trained as a physician, though there is no record of his having practiced as one. 6. It is his poetry that made him famous, and among his works the Tahkemoni, composed 1218-20. Written in Hebrew, it takes an Arabic form called “makama,” a rhyming unmetrical style full of wit, fancy, and flowery language. AlHarizi added to this by interweaving Biblical style and sometimes whole sentences of text that were both incongruous and fitting in their new setting. 7. The Tahkemoni has two main characters: Heber the Kenite, called the Jewish Don Quixote because of his exploits; and Heman the Ezrahite, the narrator and interlocutor. The episodes are widely varied, containing philosophical discussions and tributes to past poets, but also a humorous debate between an ant and a flea. 8. His linguistic virtuosity is staggering, as demonstrated in his “Song of the Three Languages.” Each of its 23 lines is written one-third in Hebrew, a third in Arabic, and a third in Aramaic. The Arabic portion rhymes with the Hebrew throughout; the Aramaic portions have one, two-syllabled rhyme throughout. 10. AlHarizi died in 1225, but his writing lives on. A new edition of Tahkemoni, translated into English by David Segal, was published in 2003, and a critical-philological text by Joseph Yahalon came out in 2010. In Tel Aviv, Alharizi Street runs just south of Arlosoroff between Adam Ha-Cohen and Ibn Gevirol. 1. David “Dado” El-Azar was born in Sarajevo in August 1925, to parents of Sephardic heritage. His father was a partisan who fought against the Nazis in Tito’s guerilla forces. 2. In 1940, Dado made aliyah as part of the Youth Aliyah movement and settled in Kibbutz Ein Shemer. For a time he studied at Hebrew University. 3. He joined the Palmach and fought with them in a number of battles in the War of Independence. He was twice wounded in the battle for Jerusalem. 4. At age 24, he became the youngest battalion commander in the Palmach, heading up HaPortzim Battalion, part of the famous Harel Brigade led by Yitzhak Rabin. 5. He stayed in the army following the establishment of the State of Israel. In 1961, he became commander of the armored corps, and is credited with building its strength. By 1964, he’d become chief of the Northern Command, and in this capacity oversaw the capture of the Golan Heights during the Six Day War (1967) – in just two days. 6. 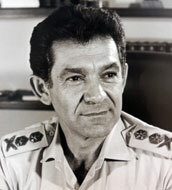 In 1972, he was appointed Chief of Staff of the IDF, its ninth. Terrorism became an important issue in these years – including Munich. It was difficult to know when to act and when not to. Under his command, for example, a Libyan airliner carrying civilians was shot down over Sinai when it did not respond to repeated requests. When the Egyptian army began carrying out frequent training maneuvers in the Sinai, lookouts began to ignore them. El-Azar became convinced that Egypt and Syria were about to attack and recommended complete mobilization, but the government, including Defense Minister Moshe Dayan, thought it unlikely and opted instead for a call-up of reserves coupled with an appeal for international pressure against Arab aggression. 7. Egypt and Syria attacked on Yom Kippur in what has become known as the Yom Kippur War. Israel was unprepared. The war, though successful for Israel, caused heavy casualties. Some commentators say that El-Azar’s ability to keep his cool during the early, trying days of the war led directly to Israel’s comeback and ultimate victory. 8. Nonetheless, El-Azar resigned his position after the war, following publication of a report that criticized his performance as Chief of Staff, saying he bore responsibility for assessment and preparedness. 9. He died of a heart attack in April 1976, and is buried on Mount Herzl in Jerusalem. 10. In 2006, in a poll of the general public, he was voted one of Israel’s top 200 greatest Israelis, coming in at number 107. In Tel Aviv, El-Azar Street can be found in Neve Tzedek, near the sea. In Haifa, it runs along the southern coast into Hubert Humphrey Street. Also, a street in Hadera is named for him. 1. David Grun was born in Plonsk, Poland (then part of the Russian Empire) in October 1886. His father was a lawyer and ardent Zionist. In this case, the apple didn’t fall far from the tree. The son was educated in a Hebrew school and at age 14, with two friends, formed Ezra, a club intended to promote emigration to Palestine. Its members spoke only Hebrew among themselves. 2. As a student at the University of Warsaw, he joined Poalei Zion. In the 1905 uprising that shook the Tsarist regime, he was arrested. 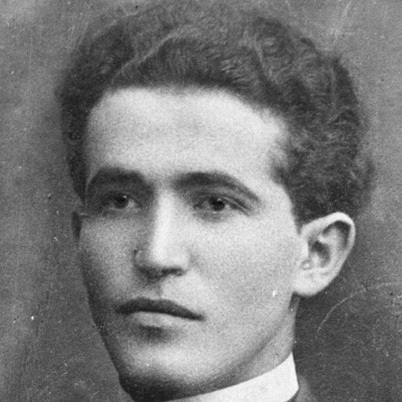 In 1906 he left for Palestine, though he insisted that it was not because life in Poland had become untenable; rather it was “for the positive purpose of rebuilding a homeland….Life in Plonsk was peaceful enough.” Following his arrival in Jaffa, he was elected to the central committee of the newly formed branch of Poalei Zion. 3. At age 20 he was involved in creating the first agricultural workers’ commune (“Kvutzah,” eventually “Kibbutz”). He was a laborer, picking oranges in Petach Tikvah, doing other agricultural work in the Galilee, withdrawing from politics. In 1908 he joined an armed group acting as watchmen at Sejera and fought a skirmish there. Then he volunteered with Hashomer, a force of volunteers being organized to guard isolated settlements. 4. In 1911 he went to Thessalonika to learn Turkish in preparation for law school. By 1912, he was studying law in Istanbul. It was then that he adopted the name David Ben-Gurion (after the medieval historian Joseph Ben Gurion). 5. At the start of World War I, he was living in Jerusalem. Believing that the future of the Jews lay with the Ottoman Empire, he joined with Yitzhak Ben-Zvi (with whom he’d attended school in Istanbul, and who would later become Israel’s second president) to recruit a Jewish militia to assist the Turks. No dice: he and Ben-Tzvi were deported anyway, in March of 1915. They made their way to the United States, where they tried to raise funds for an army to fight for Turkey. He married in New York in 1917; and that same year following the issuing of the Balfour Declaration, he changed his thinking about what was best for the Jews. 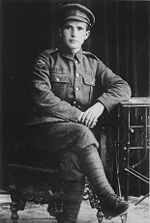 In 1918 he returned to Palestine as a member of the Jewish Legion to fight with the British against the Ottomans. 6. Following the war, and through the 1920s, Ben-Gurion increasingly took leadership of labor politics. Amid opposing ideas and factions, he was a founder of Histradut, which became a central force in the economic and social affairs of the Jews under the British Mandate. Its role, as he saw it, was to build a Jewish economy under the leadership of a Jewish working class. Labor Zionism became dominant in the World Zionist Organization, and by 1935 he was chairman of the Zionist Executive, the movement’s highest directing body, and head of the Jewish Agency, its executive branch. As such, he led the struggle for an independent Jewish state. He was an early supporter of the partition of Palestine, having tried in the 1920s to make peace with the Arabs, and failed. Initially a proponent of restraint with regard to using violence, he called for a “fighting Zionism” when Britain took a pro-Arab stance on the even of World War II. 7. He believed the Negev offered an opportunity for Jews to settle unimpeded and settled in a kibbutz there called Sde Boker. He also resided in Tel Aviv in what is now called Ben-Gurion House. It was in Tel Aviv in May 1948 that he declared the new State of Israel, a nation that, he said, would “uphold the full social and political equality of all its citizens, without distinction of religion, race.” Had he ever doubted this time would come? In 1946, he’d met and become friends in Paris with Ho Chih Minh. The latter offered a Jewish home-in-exile in Vietnam. Ben-Gurion turned it down, certain that a government would be established in Palestine. So it’s fitting that he was the first to sign the Israeli Declaration of Independence, which he’d helped write, and that he became the first Prime Minister. 8. He knew war would immediately come, and when it did he looked upon it as a means to conquer – and therefore confirm ownership of – the land. To do so, he consolidated the army, uniting the various Jewish militias – by force, when necessary – into the IDF, the Israel Defense Force. 9. As the first Prime Minister, he built state institutions and oversaw development of the country, including the absorption of great numbers of diaspora Jews. Among the national projects he presided over: “Operation Magic Carpet,” the airlift of Jews from Arab countries; construction of new towns and cities, settlements in the Negev, and construction of the national water carrier; creation of a unified school system. One controversy (there were many, but this one stood out) surrounded his working with West Germany to secure compensation for Nazi Germany’s treatment of Jews. Reparations in the amount of $715 million were paid. 10. Ben-Gurion continued in office as Prime Minister and then Minister of Defense and then Prime Minister again, until 1963, when he stepped down from office. In 1970, he retired from political life entirely. His years in office were marked by remarkable events (Suez Canal campaign, capture of Eichmann, establishment of a secret nuclear facility, to name a few), and always by intense political conflict. Even today, historians argue about his actions toward the Arabs, whether or not he was involved in a policy of forced expulsion. 11. What cannot be denied is the extraordinary way in which he combined a vision of Jewish unity with pragmatic politics and military tactics – plus a great sense of humor. Charismatic and controversial, he remains one of history’s great characters. Time Magazine named him one of the hundred most important people of the twentieth century. Consider this summary just a start: a dozen things can’t begin to scratch the surface of Ben-Gurion’s life and contributions. He wrote memoirs and published his collected speeches and essays. Start there. Then there are the biographies of him, the histories…. 12. 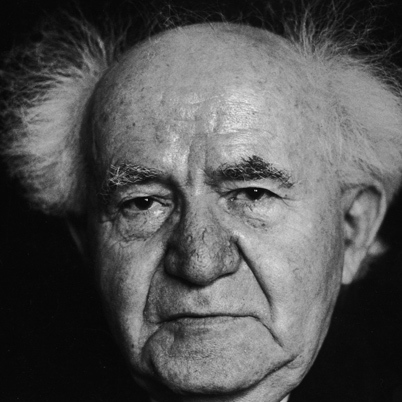 David Ben-Gurion died of cerebral hemorrhage in December 1973. He is buried alongside his wife, Paula, at Midreshet Ben-Gurion, a research center in the Negev. In Tel Aviv, Sederot David Ben-Gurion runs toward the sea from the northwest corner of Rabin Square. In Haifa, it runs from the Bahai Gardens down toward the port. The largest airport in Israel is named in his honor, as is the university in Beersheva. His home in Sde Boker is now a visitor’s center, the one in Tel Aviv a museum. 1. Joseph Ben Ephraim Caro was born in Toledo, Spain, in 1488. A few years later Jews were expelled from Spain and then Portugal, and his family resettled in Nikopolis in the Ottoman Empire. His father, Ephraim, was an eminent Talmudist who taught his son well. After his death, young Joseph was brought up by an uncle. Death continued to stalk his family throughout his life: he married early, lost his wife, and went on to marry and lose several more. All together, he had six children. 2. As a young man, he earned a reputation for excellent scholarship. He wrote Kesef Mishnah, citing and explaining the sources in the Maimonides Mishneh Torah. 3. In 1535, after years spent in various locations in Turkey and then Egypt, he arrived in Palestine and settled in Safed, where, he was appointed to the Rabbinical Court of Jacob Berab. He established a yeshiva, teaching Torah to over 200 students. 4. When Berab died, Caro became head of the Rabbinical Court in Safed, by then the central rabbinical court of Palestine, its rulings considered final and conclusive throughout the Jewish world. 5. Contacted by sages throughout Palestine and the diaspora, who sought his halachic decisions and clarifications, he developed the grand idea to codify all Jewish law, not only applying the responsa of all the prominent legalists, but also taking community customs into account. 6. The result was his Beit Yosef, a commentary on the Arba’ah Turim (“the Tur”), the work of Jewish law then current. He began it in 1522 and finished twenty years later. His all-encompassing mastery of Talmud and legalistic literature is evident in it. He discusses every law starting with its source in the Talmud, tracing its development, considering every divergent view and finally ruling on the law – usually, though not always, basing his rulings on the majority view of Isaac Alfasi, Maimonides and Asher ben Yehiel. 7. 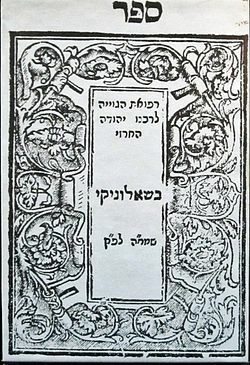 Caro is best known today for his Shulhan Aruch (1565), a concise condensation of Beit Yosef that lists only the final rulings. The title translates as “The Prepared Table.” Written for young students, it made halachah available to even the simplest Jew. It was the first such code ever to be printed on a printing press, and it was distributed around the world. Because it was written primarily according to Sephardic tradition, it was later supplemented with Ashkenazic commentary by Moshe Isserles [see my post of May 15, 2013]. In this form it remains the go-to source today. 8. For a period of over fifty years, Caro kept a diary in which he recorded the mystical visits to him of an angelic teacher who instructed him, berated him, and spurred him to acts of righteousness. Many years after his death, the diary was published by Kabbalists as Maggid Meisharim (“Preacher of Righteousness”). 9. Caro produced other halachic works and many responsa. If you make it a practice to stay up all night on Erev Shavuot, you’ll be pleased to know that Caro was one of the originators of this practice. 10. Rabbi Yosef Caro died and was buried in Safed in March 1575. A synagogue there bears his name, though it is not the original synagogue, two others having been built earlier, but destroyed by natural disasters. Rabbi Yosef Caro Street in Tel Aviv runs between Derekh Petach Tikva and the Ayalon River, just south (appropriately) of Isserles.